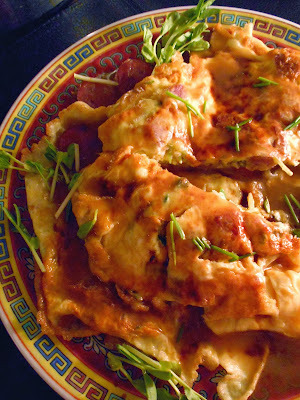 For the egg foo young: In a large bowl, combine eggs, lop cheong, pea shoots, green onions, corn starch, salt, and peppers. Beat to mix well. Set aside. In a shallow, nonstick skillet, heat oil over medium high heat. Carefully spoon ladleful of egg mixture into hot oil. Gently flip edges of patty over, and cook until light brown, about 2 minutes. With a large spatula, carefully turn patty and cook for another minute, or until patty is just set. Remove to heatproof platter, cover, and place in oven. Repeat until desired number of patties is prepared. For the gravy: Heat stock over high heat until boiling. Add roux and stir until slightly thickened. Add oyster sauce, soy sauce, sesame oil, garlic and onion powders, salt and peppers. Stir to mix well. Mix cornstarch into water and pour into boiling mixture. Stir until thickened. Check seasonings. To serve: Place egg foo young on platter. Spoon gravy over all, garnish with green onions, and serve at once. It looks too much easy, and the gradients are also easily available.I'll definitely try to make it.